That’s at least one way of demonstrating how eternalism logically entails from SR. In order to avoid the conclusion in C2 you have to deny P1, P2, and P3, as well as SR1 and/or SR2—but in doing so you are denying the fundamental principles of Special Relativity in order to avoid eternalism. In my experience, most skeptics of eternalism simply assert that there's an objective reference frame but that it's completely undetectable and they usually claim that all the experimental evidence that confirms the physical predictions of Special Relativity that entail eternalism, like length contraction, or time dilation, or that there is no objective motion or rest, are in some a sense illusions tricking us into thinking eternalism is real. As I will explain later, to me this is not much better than positing angels or demons interacting with the universe but then claiming they're completely undetectable and that we're under the illusion that its all natural. There still exists some justification needed for some of the premises, particularly premise 2. If P2 is true, then the conclusion C2 inevitably follows, at least as far as I see it. 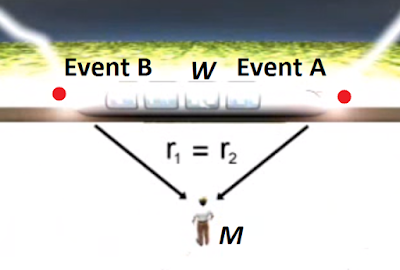 A big problem some presentists will have with P2 is the claim that events A and B will have to have physically existed simultaneously from the reference frame of M. They will want to argue that W's frame could be the objective one, and in that case, events A and B will not have physically existed at the same time (if W's frame is the objective reference frame), even though from M's frame all measurement and evidence makes it seem that way. But this view has several problems. For one thing, it potentially throws into question all of our empirical evidence since we wouldn't be able to trust our own senses and experiments to give us accurate data, and that could undermine all of science. In P2, M has measured the distance between event A and him and event B and him, and knows they are equal (r1 = r2), and he knows that the speed of light is constant from a plethora experimental data and scientific theory. But the presentist says that this all could still be wrong. 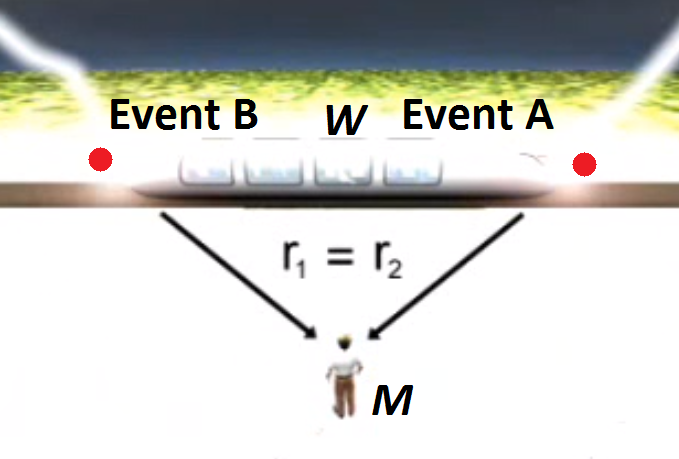 In W's frame, event A happens first, and then event B, and the distance light has to travel from event A to M is greater than the distance light has to travel from event B to M since M is moving away from event A. 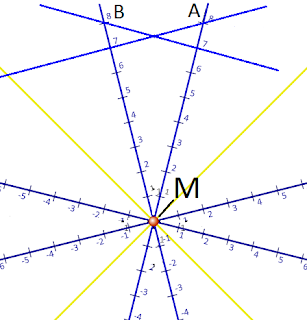 So on this presentist view, M is just deluded by his senses and his measurements into thinking events A and B are an equal distance from him and that r1 = r2. He will empirically measure this to be true in his reference frame, but those empirical measurements will be false, and there will be no way even in principle for M to know this. In essence, to deny P2 would be to say that either the speed of light isn't constant for all observers, or that its speed changes depending on the movement of light source, or that r1 and r2 are measured to be equal under the same laws of physics that apply to W, but really aren't, even though it's possible that M set up two steel rods of equal length and laid them down along the path of the light from events A and B, and cameras along the length of each rod recorded the lights immediately from each event and as they traveled down the rods to M at every point. The presentist would be saying that the rod for r2 (from event A to M) is longer than the rod for r1 (from event B to M) even though they were created the same exact length! Nothing in Special Relativity says this is the case. This is just the presentist's assertion of this possibility, and it would have to deny SR1, SR2, or both. What's their scientific explanation for why M empirically measures r1 to be equal to r2, but r2 is really longer than r1, when the laws of physics are the same for both M and W? What's their scientific explanation for why W in this hypothetical scenario measures the true nature of the world (because she's in the rest frame) but M doesn't when the laws of physics are the same for both M and W? For C2, when it says "their ontologies must both physically exist," that refers to the events along M and W's "now" slice or simultaneity plane—what they each consider to physically exist with what they consider now. It logically entails that they each reach the same point at the exact same time. If (1) and (2) are true, the conclusion (3) is unavoidable. And if we reverse the scenario, each marble must end up at the top of the pipes where they began their journey at the same time ontologically. What reason do we have that the distances are the same in the train scenario? They are measured to be exactly the same (r1 = r2). What reason do we have that the speed of the light travelling over the distances is the same in the train scenario? We have SR2, which is a bedrock principle in physics. So in the train scenario, with Special Relativity, we have a scenario exactly like the marble example above which shows that if the speed of the two marbles and the distances they travel are exactly the same, it logically entails that they must end up and start off ontologically simultaneous. The only way to deny this is to say that the speed of the marbles is not the same, and/or the distances they both travel are not the same, hence one must deny (1) and/or (2) above. Since no one scientifically minded wants to deny SR2, that leaves the denier the only possibility of denying train scenario equivalent of (2). There are additional reasons why eternalism entails from the experimental evidence supporting Special Relativity, like length contraction and time dilation. The Philosopher of Physics Vesselin Petkov argues that the measured relativistic effects would be impossible without the four dimensional world of eternalism being true. Two worldtubes, A and B, move with respect to t and t'. The three dimensional cross section L1' results from the intersection of worldtube A from an observer comoving with t'. It shows the relativistically contracted length of the body measured by that observer. The length contraction of a body is a manifestation of its worldtube. No deformation and no force is involved in this effect, as Minkowski argued. The contraction of worldtube A by an observer moving along t' is simply due to a different cross section of it P'P' existing simultaneously. According to an observer moving along t', worldtube A is in motion, and so is length contracted. Hence L1' is shorter from the reference frame of t' than in the frame of worldtube A who measures it as L1. "It must be stressed," Petkov writes, "that the worldtube of the body must be real in order that length contraction be possible because, while measuring the same body, the two observers in relative motion measure two three-dimensional cross bodies represented by the cross-sections PP and P'P'," and he adds that "a spatially extended three-dimensional object is defined in terms of simultaneity - all parts of a body taken simultaneously at a given moment." (p.81) This is seen even more dramatically when comparing L2 with L2'. Now consider the presentist who says it's possible only one reference frame is the "correct" one. Let's say it's an observer who's still relative to t. That would mean that worldtube B's actual length, that is to say, its objective length, is really the equivalent of L2 and not L2' at all times on the t axis. And yet the length equivalent to L2' is measured from an observer comoving with t'. This can be done with light signals or a physical instrument like a measuring stick, or a number of other ways. How is that possible if the length of worldtube B objectively is L2? 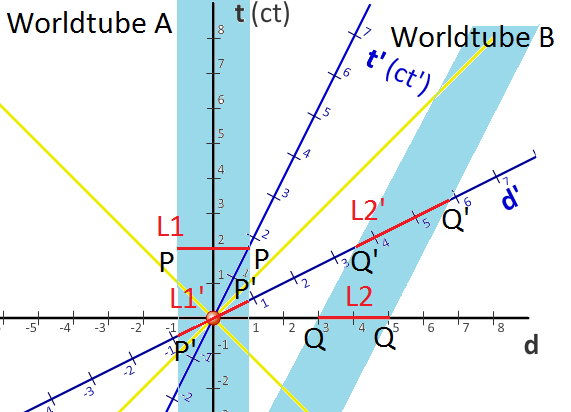 L2' is the length of worldtube B from its reference frame; it is its simultaneous length from each end of it, shown as the distance between Q'Q', but the presentist says this length cannot exist because Q'Q' do not exist simultaneously! This would be impossible to measure and is incompatible with Special Relativity. The four dimensional world Minkowski showed us, which philosophically is eternalism, perfectly explains why length contraction exists, and why we get the measurements we get. These things are impossible if there is an objective space and time. Hence, the physical meaning of length contraction is a manifestation of the four-dimensionality of the world. On presentism, both observers would measure the same length in contradiction with relativity. And the presentist, it seems, is forced to take the position that the measurements of the length of objects simply just don't count as evidence of objective reality. Two observers with clocks travel along the worldtubes of A and B. At event M they sync their clocks up right as they pass directly by one another. Their clocks each record each second that passes from that point on. They each perform an experiment that lasts 7 seconds. Each observer wants to determine the length of time the other took to perform the experiment. Observer A wants to know what clock reading was simultaneous with A's clock with the end of B performing the experiment (when B's clock is at tB=7), as seen above, the 7th second of the B-clock falls in the simultaneity plane which corresponds to A's clock is at its 8th second. 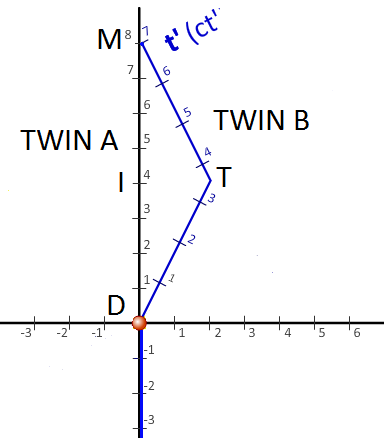 Since tB=7 is simultaneous with tA=8, A concludes that the duration of the experiment for B is 8 seconds. Hence, for observer A, when B is done with the experiment at tB=7, 8 seconds have gone by for A. Observer A thinks B took 8 second to perform the identical experiment that took A only 7 seconds. This is the time dilation effect in action: observer B is in motion relative to A, and time slows down for objects in relative motion. Now observer B tries to do the same thing using the same methods and concludes the same picture that A concludes: for B, A took 8 seconds to perform the experiment, since tB=8 is simultaneous with tA=7. This also shows you that time dilation effects (as well as length contraction effects) are symmetric. This implies that the entire worldtubes of A and B must exist and not just at a single objective point. If existence were absolute, no reciprocal time dilation effects would occur. If we assume that observer A's clock is the "objective" one, both observers should agree that A's clock existed in its 8th second, whereas B's clock existed in its 7th second. Observer B would not conclude that A's clock reads its 7th second when B's clock is on its 8th second (which is simultaneity according to B's frame). But observer B does, and that's because time dilation effects are symmetric; therefore, presentism obviously contradicts relativity since the time dilation effects could not be reciprocal if both of the clock's existences were absolute according to a preferred frame. 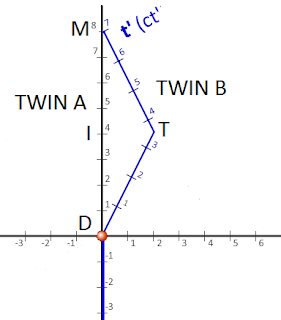 Initially twin A and B are at rest with respect to one another. At event D twin B leaves for the round trip journey, turning back at event T and reuniting with twin A at event M. Twin A's worldtube is a straight line, which means he doesn't accelerate. Each notch on their worldtube's mark off a year that has passed for them. As you can see, where 8 years have passed for twin A at event M who remains on earth, only 7 years has passed for twin B who made the trip. This is an absolute fact all observers will agree upon. Let's see why presentism cannot make sense of this. The notches on the twins worldtubes represent their proper time. The proper time in relativity is the passage of time in the rest frame of an observer. It is the time that elapses on a worldline connecting two time-like separated events. On presentism, proper times would not be relativistically dilated, and so the proper times of two observers in relative motion must flow equally. This means that if there was an objective "now" and the twins were three-dimensional objects that only existed at that now, there would be no time difference between them at event M when the reunite. Each of the empirically tested predictions of Special Relativity like length contraction and time dilation make no sense on presentism, and arguably are impossible, but on eternalism they all make perfect sense and are explained by the fact of eternalism. Other deeper philosophical questions arise. If presentism is true, why is the speed of light constant at all? There should be no reason why it doesn't behave like any other substance. On eternalism the constancy of light makes perfect sense since the ability to travel faster than light allows you to travel backwards in time and that would open up paradoxes. And why should time dilation or length contraction exist? Time dilation is a direct effect of the constancy of the speed of light. Length contraction is explained by eternalism in that it's due to the way relative observers in motion cut the worldtube's of the others with their relative "now" slice. None of these things makes sense on presentism. They "just are." In other words, the presentist argues, we're all deluded by our scientific theories and experiments into thinking that motion, rest, simultaneity, and time are all relative and that the universe is an eternalistic block, but the present really is absolute and time and space exist at some undetectable privileged "now." In this sense, presentism's claim to an objective reference frame is similar to a supernaturalist's claim to angels and demons operating in the universe. The theist claims they exist — but their effects cannot be measured in any way, perhaps even in principle, and everything they do will always appear exactly as if it were natural. At the very least, I think an honest person who assesses the evidence should see that the over all body of evidence heavily favors eternalism, even if they do think presentism is possible.